Welcome To Cool Crest Miniature Golf! In observance of Good Friday, April 19, 2019 and Easter Sunday, 4/21/2019, Cool Crest will be closed on these days. Come join us, we will be open Saturday, 10 am – 10 pm. Remember, gates close 1 hour prior closing to allow for play-through. Remember, Cool Crest gates close 1 hour before posted closing time to allow for play-through. For private parties. Please call 210-702-2290 to schedule. 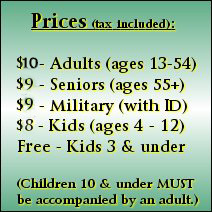 Welcome to Cool Crest Miniature Golf, located in San Antonio TX just north of downtown. We’re the nation’s premier miniature golfing destination! Come test your putting skills against these 2 challenging but family-friendly 18-hole courses. 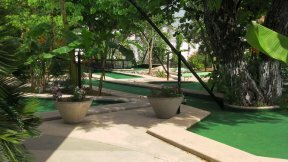 Nestled under the shady canopy of beautiful banana trees and other lush vegetation, with the quiet murmur of its running brooks and fountains, and the kiss of a gentle breeze whispering through its gently sloping terraced courses, both first-time players and serious putt-putt enthusiasts enjoy coming here to play a round or two of miniature golf here at Cool Crest. For those “aces” who are up to the challenge, make a hole-in-one on either of the two finishing 18th holes and win a free round of golf! And if one round of golf just wasn’t quite enough, play a second round at a discounted price! You can also make party reservations here at Cool Crest. Reserve the spacious outdoor patio area for your next birthday party, corporate team-building event, or any other festive occasion and enjoy the day or evening recreating with your family, friends and co-workers! Simply call or come by to take a look, and we’ll be happy to answer any questions you might have. For an afternoon or evening of good old-fashioned entertainment, bring your family and friends to Cool Crest Miniature Golf course, conveniently located on Fredericksburg Road at Interstate 10 just north of downtown San Antonio. Light snacks and cold drinks are available onsite – and be sure to pick up your Frequent Golfer Card to earn your free round of golf! Always cool and shady, you just can’t beat fun at Cool Crest Miniature Golf!